Nice little bit of perspective, eh? Which of course is why it has become such a classic image in one form or another. As we continue along with our possibly-futile search for extraterrestrial intelligence, I’m not really sure what I’m rooting for. Frankly, learning either that we’re officially alone in the universe or that we’re officially joined by others would be creepy, which is a theme with all of the surreal storylines listed above—whatever the truth actually is, it’s mindblowing. Of course, this whole question is at the very heart of Communion of Dreams. And, in a way, also at the heart of St Cybi’s Well. You’ll see. But for now, go enjoy that post at Wait But Why. It’s quite good. Turn over an old leaf. As a book & document conservator, I’ve had the good fortune to see, handle, and work on some really interesting historical artifacts. Just the other day a client came to me for an assessment of a ratty old paperback book which had been in her mother’s underwear drawer for the better part of the last fifty years. Don’t think it sounds particularly special or interesting? Well, if it’s the right kind of paperback … yeah, there’s a *very* good chance that the book she brought me would be just the fifth known copy of that very important first edition. I recommended that she deal with a qualified rare book appraiser, though everything about the book — the paper quality and age, the sewing structure and condition, the amount of dust and dirt it had collected, even the smell of the thing — all fit perfectly into what I would expect of a book printed in that time and that place and then used and loved for a century or so, then put away and essentially forgotten for another century. So, yeah, I do get to see, handle, and work on some pretty cool stuff, some of which I have documented here and over on my professional site. 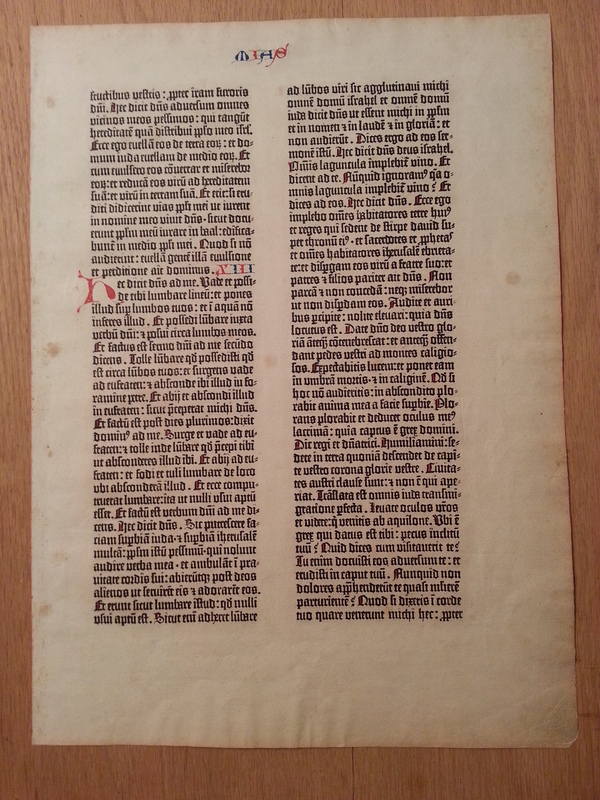 The Gutenberg Bible (also known as the 42-line Bible, the Mazarin Bible or the B42) was the first major book printed in the West using movable type. 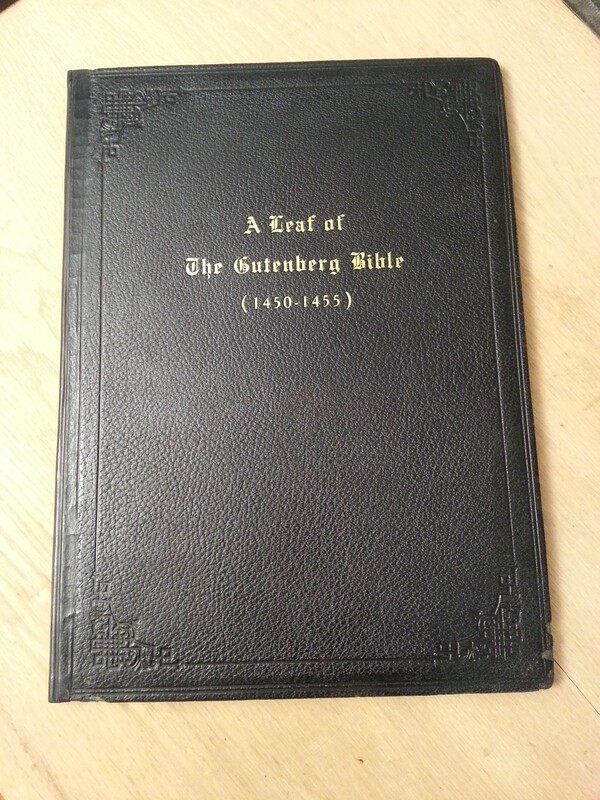 It marked the start of the “Gutenberg Revolution” and the age of the printed book in the West. Widely praised for its high aesthetic and artistic qualities, the book has an iconic status. 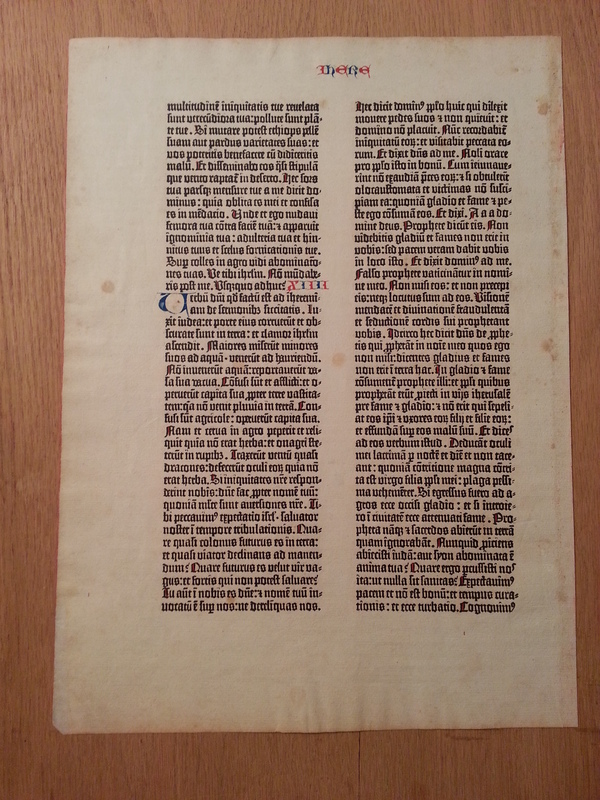 Written in Latin, the Gutenberg Bible is an edition of the Vulgate, printed by Johannes Gutenberg, in Mainz, Germany, in the 1450s. Forty-eight copies, or substantial portions of copies, survive, and they are considered to be among the most valuable books in the world, even though no complete copy has been sold since 1978. 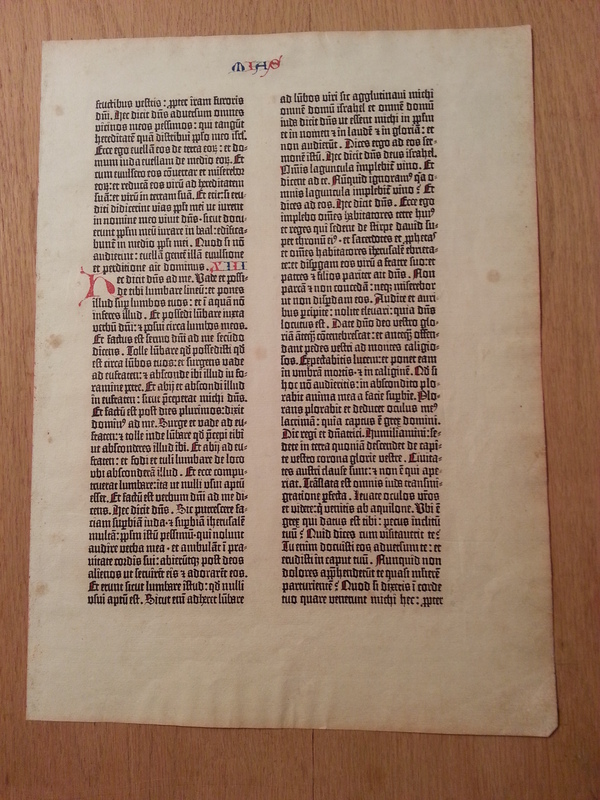 Basically, someone took a partial copy of one of the known authentic Bibles, separated it into individual leaves, mounted those into this presentation case, then sold those to collectors and institutions which wanted to have their own sample of the Bible. Each one is now worth on the order of $50,000. Front of page before treatment. Back of page before treatment. Front of page after treatment. Back of page after treatment. Almost, but not quite, invisible. That’s in keeping with current conservation practices, where you don’t want a repair to be a distraction, but you do want it to be evident to the trained eye, so they know the ‘honest’ history of the item and whether it has been treated/repaired. To be perfectly honest in another way, working on this leaf was just completely straight-forward. Cleaning and simple kozo repairs are about the simplest conservation tasks performed, and in no way are a challenge to my abilities. And yet, because of what that leaf is, what it represents, I kept it locked away in the safe until I could devote a full afternoon of work to taking care of it. Until I had completely gone through a ritual cleaning of my bindery space. Until I was at the very ‘top of my game’ in terms of focus and attention. Until I was absolutely certain that I could do the tasks required with my full and total respect. Call it Zen & the Art of Conservation if you want. Or just call it a recognition that I am only one set of hands in a long chain who for a moment (once again) had a responsibility to both the future and the past. 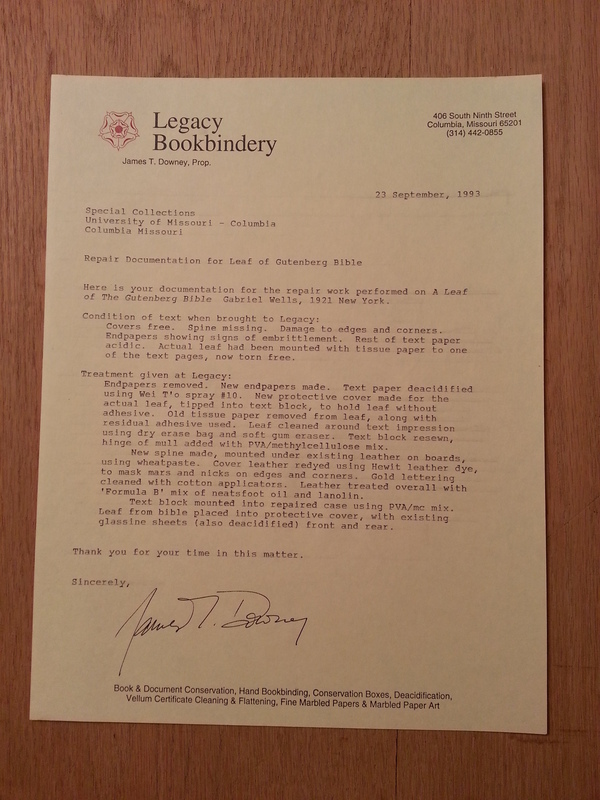 The leaf has already been returned to the care of Special Collections. PS: Tucked in the back of presentation case was this document from the first treatment I performed. Thought I’d share it as well, just for grins. Remember this from a post a couple months back? Some animals, including your pets, may be partially colorblind, and yet certain aspects of their vision are superior to your own. Living creatures’ visual perception of the surrounding world depends on how their eyes process light. Humans are trichromats—meaning that our eyes have three types of the photoreceptors known as cone cells, which are sensitive to the colors red, green, and blue. A different type of photoreceptors, called rods, detect small amounts of light; this allows us to see in the dark. Animals process light differently—some creatures have only two types of photoreceptors, which renders them partially colorblind, some have four, which enables them to see ultraviolet light, and others can detect polarized light, meaning light waves that are oscillating in the same plane. “None of us can resist thinking that we can imagine what another animal is thinking,” says Thomas Cronin, a professor at the University of Maryland who studies visual physiology. But while guessing animals’ thoughts is a fantasy, looking at the world through their eyes is possible. I’d be almost nervous to hear what someone might say about one of my books. But in spite of making solid progress with the writing of St Cybi’s Well, I seem to be at low ebb in terms of my self-confidence/bipolar cycle, so it might just be due to that. Revisiting a very old friend. The assignment is to include “a general discussion of major theories and practices and the controversies” in relation to dealing with different historic bindings. As the paper is only about 4-5 pages long, it’s obviously only able to be either very general or to cover only a couple of binding types. 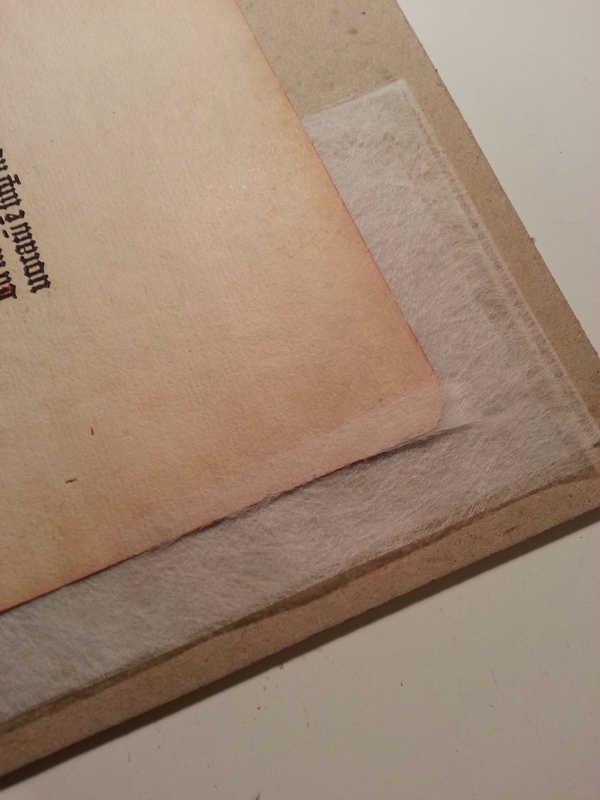 Could you give maybe a brief coverage of how you would deal with the conservation/preservation of a couple of different binding types and possible issues that you can run into when dealing with those bindings? In particular, the 1518 Ovid in limp vellum on your projects page caught my attention and was the one that got me to e-mail you. Since it’s been 5+ years since I last posted about that, I thought I would share my brief response here. 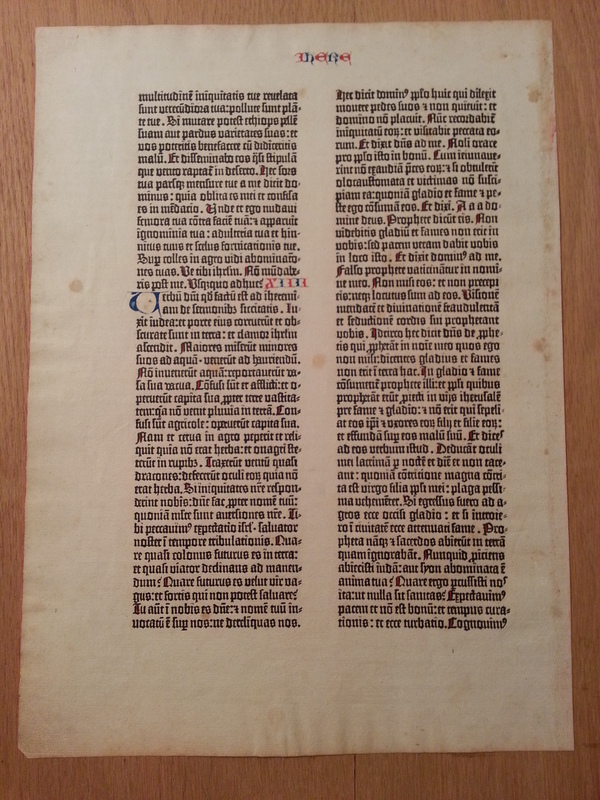 Current practice in book conservation is to respect both the original structure as well as the history of what the book has had done to it over time. Basically, that means that I seldom try to remove all traces of damage, or rebinding, or repairs, or notes from a book and try to turn it into some pristine example of what it was when first made. Usually I try to accommodate those changes, to preserve the character of the book insofar as possible. They are, after all, part of the book’s provenance, and can teach us a great deal. 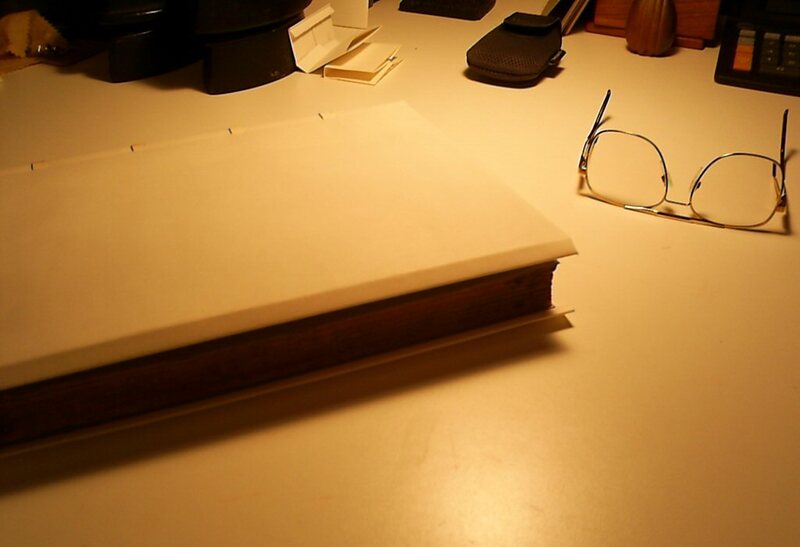 As you can see, we decided to put the book into a limp vellum structure, which was fairly typical for a simple and relatively inexpensive binding at that time. Why this choice? 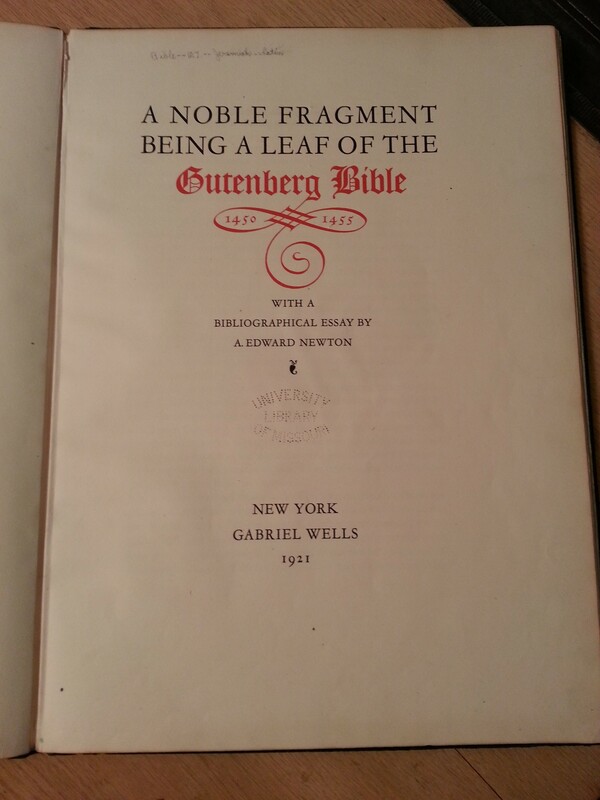 The 19th century binding the book had been in was completely breaking down. The sewing structure was failing. The leather was deteriorated. 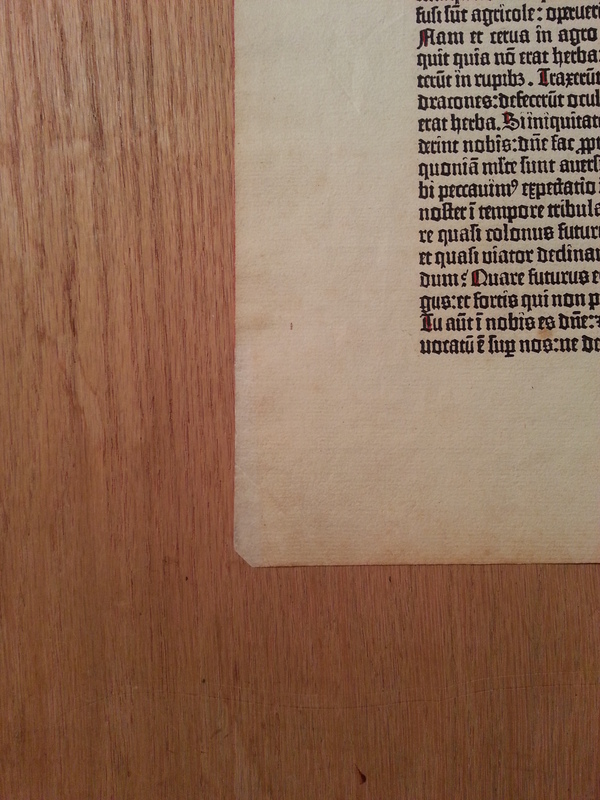 There was nothing particularly noteworthy to the style or type of binding, and the materials it was made of would continue to cause damage to the text block. So the client elected to remove that binding, though I believe that they have kept it (separately) as part of the book’s history. But since we had no records of what the book would have looked like its binding originally, we decided to go with a very simple and neutral structure. A blank slate, as it were, so as not to suggest a false history to future readers/custodians/conservators. While the style and material of the limp vellum binding are fairly timeless in themselves, the archival endpapers I added would clearly date the era when that binding had been created, without imposing an early-21st century aesthetic on the book. And if need be, all or part of the structure and materials could be easily removed in the future. Just thought I’d share that. And I do love how that binding turned out. If you haven’t yet, be sure to take a few minutes to enjoy the full set of pictures and text about the project. We’re coming up on the three-year publishing anniversary (July 15). If you haven’t yet read Her Final Year go ahead and do so. If you want to wait a month, the Kindle edition will be available for free download around the anniversary. And if you have read it, please consider posting your own review on Amazon or elsewhere. It helps. A state of matter, or a state of mind? His expert was one of best, one of only a few hundred based on the new semifluid CPU technology that surpassed the best thin-film computers made by the Israelis. But it was a quirky technology, just a few years old, subject to problems that conventional computers didn’t have, and still not entirely understood. Even less settled was whether the experts based on this technology could finally be considered to be true AI. The superconducting gel that was the basis of the semifluid CPU was more alive than not, and the computer was largely self-determining once the projected energy matrix surrounding the gel was initiated by another computer. Building on the initial subsistence program, the computer would learn how to refine and control the matrix to improve its own ‘thinking’. The thin-film computers had long since passed the Turing test, and these semifluid systems seemed to be almost human. But did that constitute sentience? Jon considered it to be a moot point, of interest only to philosophers and ethicists. And while the problem of consciousness is far from being solved, it is finally being formulated mathematically as a set of problems that researchers can understand, explore and discuss. Today, Max Tegmark, a theoretical physicist at the Massachusetts Institute of Technology in Cambridge, sets out the fundamental problems that this new way of thinking raises. He shows how these problems can be formulated in terms of quantum mechanics and information theory. And he explains how thinking about consciousness in this way leads to precise questions about the nature of reality that the scientific process of experiment might help to tease apart. Tegmark’s approach is to think of consciousness as a state of matter, like a solid, a liquid or a gas. “I conjecture that consciousness can be understood as yet another state of matter. Just as there are many types of liquids, there are many types of consciousness,” he says. Good article. Read the whole thing.